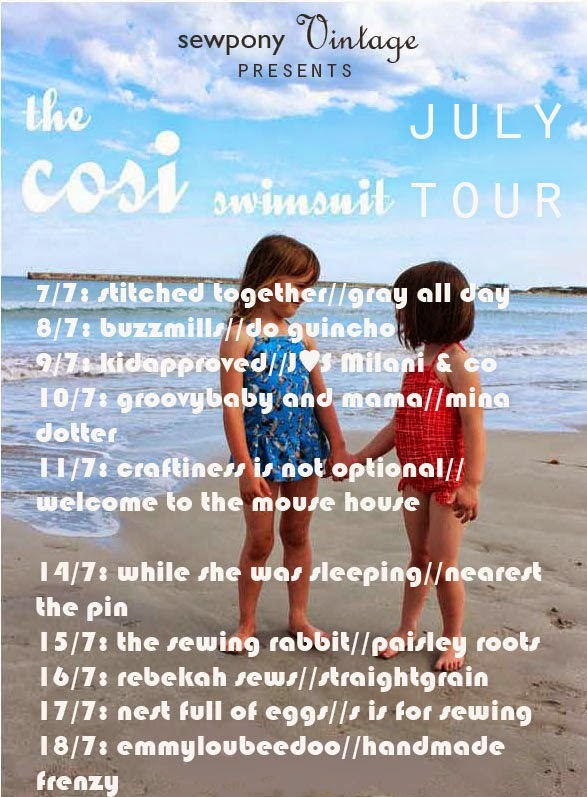 The cosi swimsuit JULY TOUR!! I am excited to share that beginning on Monday, I have 20 great bloggers lined up to share their cosi swimsuits with you all! A few of these lovely ladies helped to test my pattern and are either sharing what they made during testing or sewing up another suit! I can't wait to see them all! Make sure you come back on Monday to see my first guests and also to grab a discount code! oh, that's going to be great. i don't know some of the blogs and am looking forward to get to know them! Woohoo! I may have to wait to cut into my fabric now until I've indulged in these blogs! I better get started sewing my cosi swimsuits!!! that is just the cutest suit pattern!!! Can't wait to see all the suits... oh and I feel awful... i got busy with my family and forgot to send people over to vote for me Secret Squirrel outfit... just saw today the results... that was such a fun series and I'm so glad I was a part of it!!! Wow ! That was so cool. Thanks for sharing. I'll start sewing my own cosi swimsuits too.